Expired JellO®! Flee! FLEE FOR YOUR LIVES!!!! What does it mean to be an “Applied Empirical Naturalist”, anyway? As a naturalist, I look for natural explanations for natural observations. If I survive this ordeal, I will not explain it as being due to protection by supernatural forces, and conversely if I end up confined to an intensive care unit, my body ravaged by Expired-Gelatin-Syndrome, I will not seek to explain it as divine punishment for violating Kosher. As an Empirical naturalist, I investigate things by actual observation and direct testing wherever possible, rather than purely philosophical means. And – particularly important to me – Applied Empirical Naturalism is intended to convey that I am primarily interested in investigations with practical uses. Discovering the “Pineapple-Upside-Down Quark” with an umpty-brazillion-dollar particle accelerator and six months of supercomputer time to crunch the data wouldn’t do me, personally, much good. Knowing whether expired JellO� is safe to eat or not, however, has obvious practical application. Especially considering that I seem to have about 5 more boxes of the stuff in the pantry. So, here I sit, perhaps writing my very last words ever before Expired-Gelatin-Shock causes my brains to swell up and explode messily and fatally from my ears like the popping of two superintelligent zits, in the service of Science. Here, then, is my story. Therefore, I suffer great harm due to its ingestion. Last night, I plucked from the depths of my pantry an expired-2�-years-ago box of sugarless orange-flavored gelatin with which to begin this investigation. I blew the layer of dust off of the box, and carefully opened it, half-expecting to find some strange mutant gelatin-beast had developed in it over the years since expiration. One hand poised to protect myself should the creature leap from the box to eat my face in anger of being disturbed, I was both relieved and slightly disappointed to find nothing more than a foil packet containing what sounded like perfectly ordinary gelatin-powder. The packet proved to be intact, and the happy orange powder poured into a freshly-cleaned dish in a manner perfectly imitating that of wholesome non-expired gelatin. I dismissed the faint demonic snickering sound I seemed to hear as a figment of my fevered imagination and prepared the gelatin powder in the usual manner. 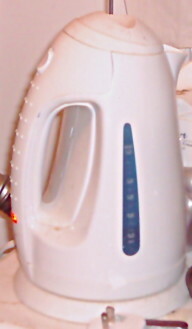 I took up my electric kettle, containing distilled water, and threw the switch. Seconds passed into minutes. Minutes passed into more minutes. Then, the water began boiling vigorously, and I applied one cup (8 fluid ounces) of this to the dish of powder, stirring it with a tablespoon. It seemed to take at least two minutes of continuous stirring, but the deceptively innocent-looking powder finally dissolved without the slightest scent of brimstone. As prescribed by the instructions on the box, I added a further 8 fluid ounces of cold water (from the tap of my kitchen sink), stirred briefly to mix, and placed the dish in the refrigerator to gel overnight. Day broke, and this very afternoon I took the now solidified mass from the refrigerator. This was it. My last chance to avoid whatever hellish abuses this disturbingly orange substance had planned for me. But no…it was far too late to turn back now. I took up my spoon, and devoured every last bit of happy orange jiggliness. This was approximately seven hours ago. In the intervening time, I have experienced the following symptoms: Occasional thirst, mild generalized anxiety about the near future, hunger, and an urge to write this blog post in a hyperbolic language more suited to an H.P. Lovecraft story than a scientific report. In other words…I appear to have been entirely unaffected, despite consuming an entire box of expired gelatin. I’ve been taught that when hypothesis-testing, one considers the “null hypothesis”. That is, the hypothesis that would falsify the one that I’m starting with. In this case, it would be something to the effect of “I will suffer no harm whatsoever from eating expired JellO�”. Given the results in this experiment I must – in the tortured language of philosophical science – “fail to reject the null hypothesis”, because my results show no evidence whatsoever that I have suffered harm from eating expired gelatin. In other words, I cannot rationally cling to my original hypothesis as written, and must confess that perhaps expired instant gelatin still in intact packaging may, in fact, be harmless. I answer in two parts: Firstly, ladies and gentlemen who are my readers, I assure you that the contents of the less-famous brand and the official Kraft� Foods brand are essentially identical, and indeed, might conceivably have come from the same source. It’s common practice for one factory’s product to be shipped to multiple sellers who each offer it under their own label, as the wide variety of affected brands during the recent “salmonella peanut butter” scare demonstrated. And secondly: as it happens, I also have in my possession a box of JellO�-brand lime-flavored gelatin, WITH sugar, which although it lists no obvious “expiration date”, has a code stamped on the box indicating that it was originally packaged in late 2003, and therefore should have exceeded the expected 24-month shelf-life about the same time as today’s test subject did. I swear to you, dear readers, that I will repeat my experiment with this sample next. Stay tuned: “Expired JellO II: Lime’s Revenge”, coming soon to a blog near you! UPDATE: The Expired JellO� Saga continues here! Dear lord, I read that as “I PUKED from the depths of my pantry”. Then I realized what it actually said and laughed a great deal. Was there any loss of flavor in your Jello? Mom suggested that it might have lost some of its flavor. Nope, no loss of flavor that I noticed. If the packet was intact, the availability of oxygen to oxidize the flavor chemicals was probably pretty limited. With high quality posts like this one – how could I not voet for you?! DONE! Is everything fine? How are you? The “How are you” post above was almost certainly spam – the name appears to be random, the email address was italian, there was a link to a site that seemed to have something to do with apartments in Guatemala, but the post came from a New York City cable-modem. Presumably yet another infected Microsoft machine. 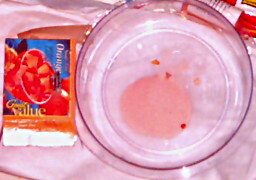 Still – yes, I’m fine, or at least there seem to be no delayed effects from eating the expired JellO®. One might follow the link at the bottom of the post to follow along on the saga. Then again, one might not. Pingback: The Big Room (and the little things in it) » Blog Archive » #1 on Google! Hmm, i read this after searching the internet as to whether sugar-free jello would cause serious food poisoning. My husband ate some pre-packaged sugar-free jello that expired 2 months ago. Somehow he didn’t notice that it had changed from it’s gelatinous form into half liquid. Tbat was about 20 minutes ago. I’m still waiting to see what happens. I’ll be waiting for the follow-up comment! Once it’s made, JellO® really has only two nutrients in it – sugar, and gelatin. Sugarless JellO® obviously just has gelatin (and a trace of artificial sweetener – from a microbial point of view, if it’s “aspartame” you can probably just consider the sweetener to be more or less the same as an additional couple of milligrams of gelatin, since aspartame is made out of a couple of amino acids). There are bacteria and fungi that can survive on just gelatin. I would guess that if there was no visible stuff growing in it, no funny odors, and no off-gassing when you opened the package that it’s probably okay (insert usual disclaimer about this not being a professional opinion, etc.). I would tend to guess that sugarless gelatin is less stable (though perhaps more attractive to microbes) than regular sugar-containing gelatin, since in most foods one of the things sugar does is help retain water. It seems plausible that the semi-liquidity of the pre-packaged sugarless gelatin was just ordinary mechanical “falling apart” rather than digestion by microbial enzymes. Please let me know how things worked out! This was absolutely amazing I must say! It really had me quite interested and not to mention laughing! Thanks for the info and a great laugh! I’m glad to see people still finding this post useful (or at least entertaining) – I’m going to have to find something ELSE to do with Expired Jello® and/or other brands of powdered gelatin product. Is it possible that the boiling hot water would destroy any bad bacteria or illness-causing “beastie” that might be living in expired Jello? It’s quite possible that boiling water dumped on the powder would kill most microbes that might conceivably be in the powder. However, there’s no guarantee that it would kill bacterial or fungal spores, nor necessarily inactivate any poisonous substances that may have been produced by formerly-living microbes. Coincidentally, today, I found a box of sugar-free orange-flavor Jell-O gelatin that expired in 2008. Today is May 1, 2010. I decided to make it, and it is in my refrigerator now. I decided to look on the Internet to see whether I was exposing myself to any risk, and I found this blog. I am glad to hear that you had no adverse results. I plan to eat the Jell-O tonight (assuming there are no gelatin monsters in it). If it should make me deathly ill, I will certainly advise! Thanks for taking the time to test the expired product ad for letting us know the result. Wow..love the blog!! I made a box of 4 year old Jello instant butterscotch pudding today (I did not look at the date until after I made it) but I don’t think I am brave enough to eat it….I guess I just wasted two cups of milk. Oh well, no use crying over wasted milk……..
Like you’re little experiment! You wouldn’t happen to know how long Jelly-shots last, would you? I’ve been doing a lot of research, and basically I can not think of anything that can go “bad” when you mix powder jelly that consist of sugar and gelatin, with pure vodka, and store it in the fridge. This is non-expired jelly we’re talking about. What do you think? If I remember correctly, you end up with something about 20% ethanol with a typical “JellO Shots” recipe, as well as being somewhat acidic (sour), which I think should be pretty resistant to most microbes that could potentially make someone sick that they might encounter in a refrigerator. So – I would guess that they’d last for a pretty long time before you had to worry about them. It is the year 2013. I have a box from 2008. Would you think this is safe to eat? If it’s still dry powder, it ought to be fine I think. I was relieved to find I wasn’t the only one with that “problem”. But my packages are FOUR YEARS expired ! So this morning I had qualms about eating the thing (apt use of that word here) I had made last night. Despite my strong belief that dry food can’t go bad. Therefore I ate only two bites. About 5 hours ago. And I’m still functional ! Now I won’t brush unsupportive data under the carpet (a bad habit acquired by many scientists). I must admit there were failures. Not that anybody died. But I had to discard some of the samples because the smell was REALLY foul (close to inducing nausea) when dissolved in boiled water. On the other hand, there was another 4 year expired sample that went down well with me (and my colleagues, shame on me). out of 5 trials (dry mixes, 3 peach, 1 blackcherry, 1 passion fruit) 4 years after ‘best before’ date. Please note this doesn’t mean the 3 discarded packages were not edible since they went straight down the sink. I hope this will help the great jellO science initiated here and I found deeply inspiring. Last detail: I’m French and my fellow countrymen aren’t too keen about jellO. It’s hardly available here and I bring some from the UK or the US whenever I can … in bulk. Hence my significant stock (most of it US-made by Kraft Foods) and the more-than-significant over-expiration. I just hate food to go spoiled. It’s still somewhat surprising to me that dry JellO powder can undergo any sort of transformation, though I suppose short of making the pouch out of metal foil it must be still somewhat permeable to oxygen. Was there any consistency to which flavors came out smelling badly? Meaning some flavours wouldn’t be as stable as others ? out of 3 peach flavour packages, I had to discard 2 because of the smell. The other one was perfectly fine (we ate it with collegues and they even complimented me on it since it’s an unusual food here, I include whole raspberries WITHIN the jelly to entice them after noticing nobody would touch the thing without them). Blackcherry was OK (the one I’m eating) but passion fruit was probably the worst (made in a Spanish-speaking country in a package twice as big as the others, which could explain the worse smell). I forgot to say your findings encouraged me to eat yesterday. In fact I was suddenly flipping out and came looking for answers on the web, your article decided me to try … two bites. 24h after first 2 bites, half of the 500mL have been ingested and no adverse effects whatsoever. Isn’t there the possibility of spontaneous chemical degradation WITHOUT external reactant ? Natural flavours often comprise esters. Esters are commonly synthesized in the lab but the ester bond is relatively weak, it can just as easily be broken (or break down by itself ?). If we are to believe https://answers.yahoo.com/question/index?qid=20100302112111AAwB5rk (from a PhD in Food Chemistry and Nutrition ! 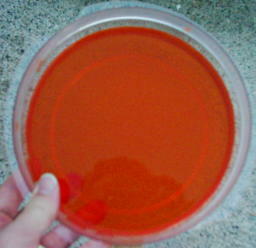 ), among the few jellO mix ingredients, the flavouring agent is most susceptible to degradation.